We respectfully request that you park your vehicles along Dolme Ave between Cranfield and Hollinger for this weekend. Once the lines are repainted, normal parking can be restored. We humbly apologize for this inconvenience. The lines better be purdy. We're hoping for pink. Well - bugling it - actually. Which, in the tradition of Punday means - we have bugles! You should Czech them out - the skinny on these long beads is that they are totally tubular. 7 & 12 mm. For all those ornament designs - you know - for ... Christmas. Because it is almost August, and you need a good running head start on these things! But if the thought of Christmas startled you - like this owl here - I apologize. Doesn't his expression look like he just encountered a proct-owl-agist with cold claws? We have enough owls to start an owl sanctuary - both buttons and beads. We give a hoot, really - I'm sorry - that joke probably made you 'owl. I see the tension is rising to a beak - I'll probably have to wing it out of here. The owls are Czech too - and part of more of our yummy Czech glass beads. And I do mean yummy! Coconut Slice, BlackCurrant Ice Cream, Plum Silk, and Rochelle. That last one is not actually named for a food - but no less yummy for all of that. Rochelle fell on this at the unboxing and fondled them. So be warned - these beads have been pre-fondled. Personally - my faves are the Geology and the Turquoise Picasso - although I already have plans for a bunch of these Central Cut beads too. And so there it is for this week - click on a link or image above, or just check out all the new items here and see what rings your bell! Alcohol + Ink = Art! Sorry to disappoint you, but when I mention Alcohol Inks (AI), it's all about art, and absolutely nothing to do with drinking alcohol! Of course, when you’re working with AI, it doesn’t hurt to have a wee dram of something comforting, but it’s certainly not mandatory, as these inks are so much fun! 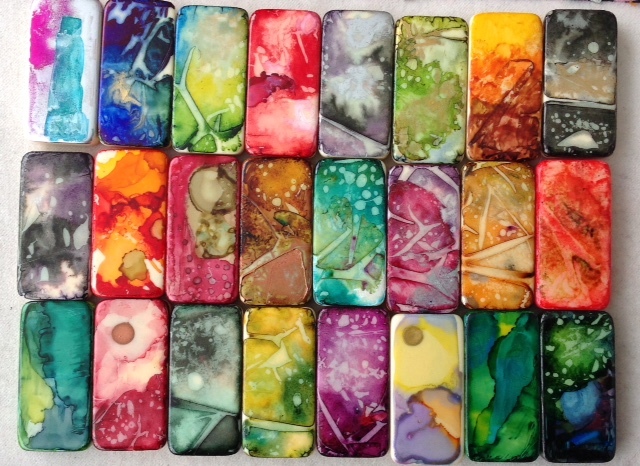 Alcohol Inks are tiny little bottles of sheer, saturated colour! I’ve used them on various non-porous surfaces (after all, that’s what they were designed for), in resin, polymer and epoxy clays (both before and after the product cures). My all time favourite slick surface, is ceramic tile, but they can also be used on marble, various metals, glass, hard plastic, game pieces, old CD’s, washers and Yupo paper (a synthetic polypropylene paper with a slick surface). I’ve cut open pop cans (a.k.a., soda cans), and used the inside surface. I admit that I haven’t tried transparencies yet, but I see no reason why it wouldn’t work. I’ve even heard of people adding a coat of gesso to artist canvas, and then using the inks on those surfaces. Glossy photo paper is also an option (but falls in the trial and error category), but another that I haven’t tried. I've heard that some people, actually use the back of the paper, and that not all papers are equal. Who knew? There are two main brands on the market, one from Ranger called Adirondack, and the Jacquard Pinata colours. If that’s not enough, you can supplement your inks, with a whole slew of markers (and re-inkers for some of them) including Copic, Spectrum Noir, Prismacolour, and even the lowly Sharpie. I know that there are more out there, but none that I’ve seen locally! Now what does this have to do with jewellery and art, you say? I may be prejudiced, but quite a lot, I think. Although these inks are fast drying, and definitely have a mind of their own, they allow you to work at various levels of expertise, and on many different surfaces. At an introductory level, they provide a quick colour fix, make you look like an expert, and are very easy to use! 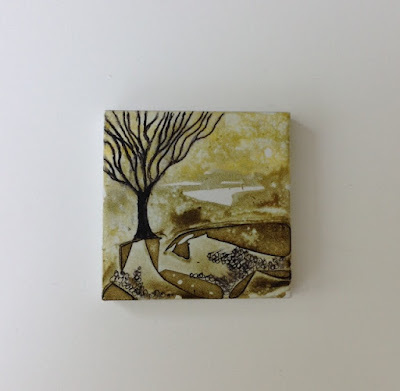 Add paper collage &/or embellishments, and you have a mini-piece-of-art (for example, an altered domino, or mini-tile). At a more advanced level, harnessing the ink properties, presents more of a challenge. You might consider adding markers (including permanent ones), resists, paintbrushes, other paints/resin/ink, canned air, etc., to add more depth to your work. Add chain, leather, bead weaving or stringing, and your Altered Dominos, metal and glass pendants, are suitable for art jewellery pieces. Work in a larger format, and you have art to frame! There are plenty of resources for AI aficionados! BeadFX classes, You-Tube and Facebook are only a few. I warn you, that the inks are pretty stinky, so make sure that you take the necessary safety precautions. Work in a well-ventilated room, and if necessary (especially if you have breathing difficulties), make sure that you use a respirator! As the inks are not U.V. 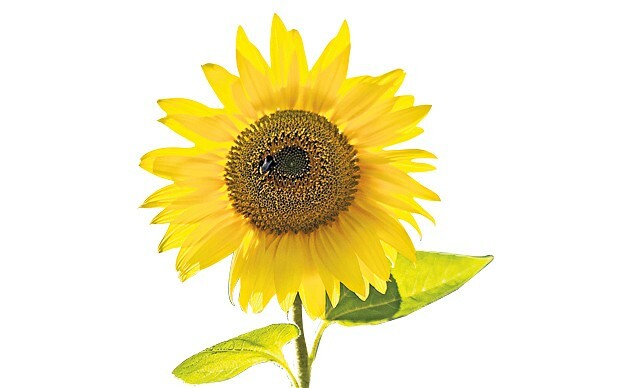 resistant, you will need to add a spray or two, to keep them from fading over time. But that being said, try not to spill them, or get them on your hands. I dare you! I love my Alcohol Inks, and I also love addicting (err, teaching) others how to use them! There’s nothing else that compares, to that quick jolt of colour!! Abstract or representational, it doesn't really matter....you're making art, relieving your stress, and enjoying the heck out of yourself, along the way!!! Can you believe we're heading into August? I was looking up ideas for themes of what to talk about for this blog post. Did you know that not only did the Roman Senate name a month after Caesar Augustus, but it decided that since Julius's month, July, had 31 days, Augustus's month should equal it. In the Julian calendar, the months alternated evenly between 30 and 31 days (with the exception of February), which made August 30 days long. So, instead of August having a mere 30 days, it was lengthened to 31, preventing anyone from claiming that Emperor Augustus was saddled with an inferior month. It also means we have one more day of beading, soldering, knotting, metal clay and lampworking - and anything else we may want to do! Discover the joys of working with Red Bronze, White Bronze and Copper metal clays. Bring your projects and and any questions! Be among the first to see the new weekly products. 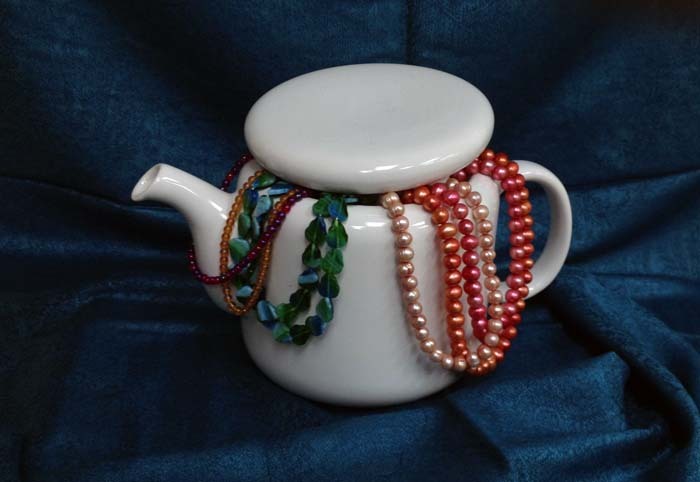 Learn to make a wonderful rope with various sized beads. Discover how to turn simple dominoes into beautiful jewellery. Complete information about each activity is available by clicking on the title. 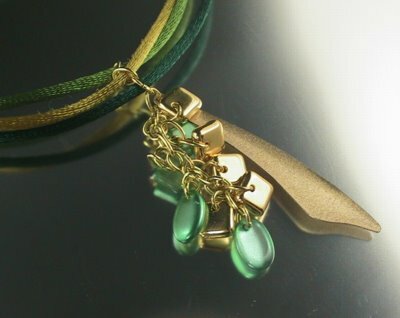 You can also go to www.beadfx.com and click on 'Classes'. 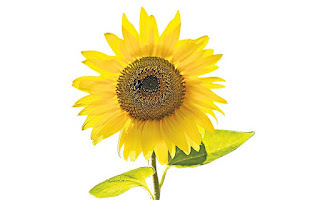 Follow the links to the August class calendar and click on the individual classes and sessions. 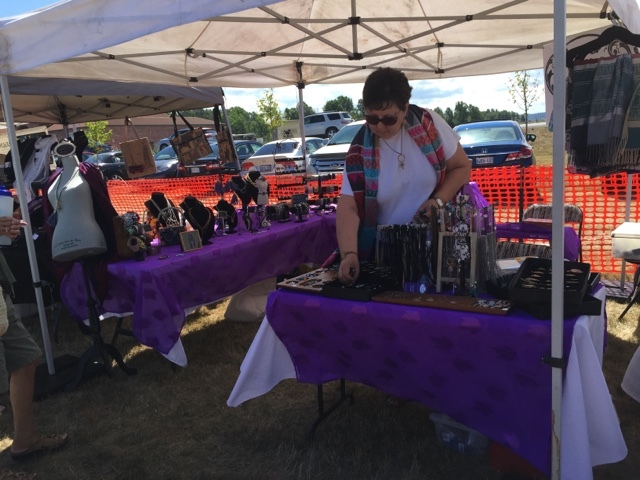 Well it's been a few weeks since my partners and I participated in the last of three outdoor summer markets and I'd like to share my thoughts on what went on. I hope my feedback helps anyone thinking about doing the same, and I'd love to hear from those of you who participate in juried and/or non-juried indoor and outdoor shows in the comments section. Together we can make each other better and more successful. My partners and I conceived of our collective, Bench Artisans, at the beginning of the year to create a cohesive front as we applied to take part in shows around the Niagara region. The name reflects the work we do while playing off the wine "bench" of the region. We were successful in being accepted into one show by the Handmade Market people and then Artistry by the Lake and lastly the Lavender Festival. All of these shows are well-established with an audience and had affordable entrance fees. We had start-up costs: securing the business licence and domain name; application fees; purchasing a tent, tables and decor; and marketing materials such as business cards and signage. In advance of the event, we set up a Facebook page and we collectively and individually promoted the event through that. Of course, one of your biggest expenses is materials to create an inventory for sale. Then came the fun and creative part: we had to determine how we wanted to set-up the booth, what we wanted to focus on, and the kinds of goods we would be selling. With three partners, it was important to ensure that we had space to show off our best work while maintaining a cohesive appearance in our display. We decided on a purple and white scheme for the decoration, and we stuck to black velvet fixtures and scrolled metal stands to display our work. 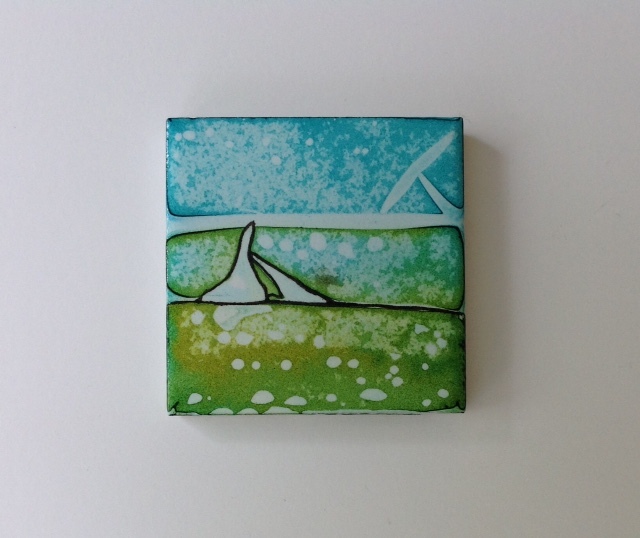 We also decided, early on, to showcase the metal clay work by Sue in a charm bar. 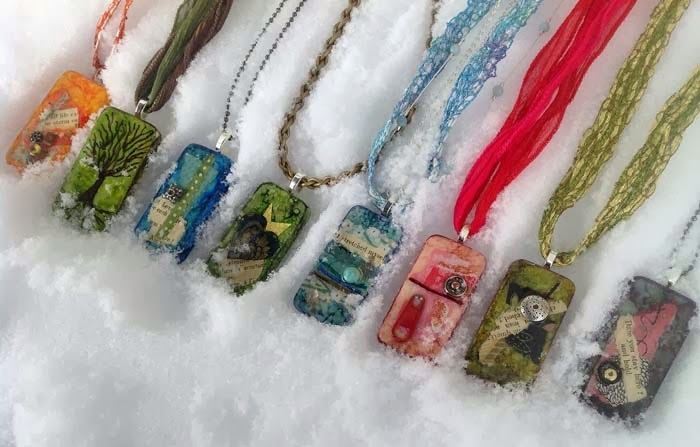 The charm bar would encourage people to design their own necklace, combining metal charms with pearls, lampwork and other pieces we had already wire wrapped. Everything a customer chose would be joined together by jump rings and hung from their choice of neck wire. 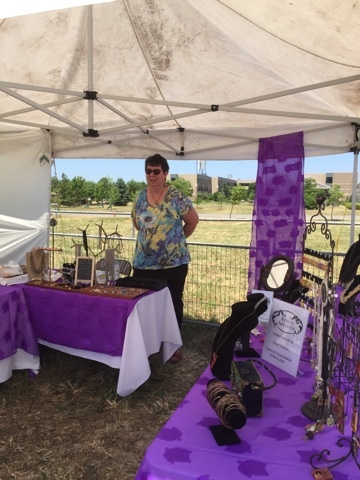 Here's a picture of our first booth set-up in June at the Handmade Market. After that, a picture of our booth set-up at the next two shows. You'll notice we moved the charm bar to the front and we added scarf jackets for sale, displayed on a Judy near the front of the booth. Guess what sold the best at the last two shows? Yup. Charms and scarves. Overall, I think it's important that you understand clearly the audience the show at which you are selling attracts. Very few shows attract buyers who are interested in paying full price for art jewellery. Instead, people want to buy something fun and inexpensive or possibly a present for someone. One reason I think the charm bar worked is because parents indulged their kids in it - and the sale of several inexpensive charms adds up, incrementally, to the cost of a pre-made necklace in many instances. But don't romanticize this method of selling your stuff. There are some pros: you develop your brand and people take your card - if you teach like I do you can encourage people to come out and take classes; you see what other designers are up to and sometimes barter for each others' work; you meet people and find out what their interests are which can help you develop your own inventory; you might get some interesting commissions or repair jobs and make money post-show; and you do make some money - hopefully enough to cover your costs and allow you to enjoy a nice dinner when it's all over! 1. Weather is a huge problem - either it's too hot, too cold, too windy, too rainy, or too humid. We ran into all of these variations except too cold and too rainy over the run of three shows. 2. Shrinkage - people do steal. But you can't watch all of the people all of the time. 4. The category you're selling in is overcrowded at the show and there's just too much competition for buyers' dollars. This is true of jewellery at most shows. By diversifying and adding scarf jackets our profits went up. Also some shows allow vendors who don't sell handmade and they compete with cheap imported goods, undercutting your sales. 5. There's a lot of physical labour involved in setting up a tent booth. Be prepared and recruit young people to help! We learned a lot and are hoping to get into some indoor shows this fall and winter. I'll update you on our success after that! I call this "Purity" because the colours remind me of the innocence and promise of a warm summer morning. Of course, you can choose your own colours too - and maybe then it will remind you of something else instead! against that for length. So adjust the length of this as required for your wrist. Again, I am using the Stretchy cord, as I love how simple it is to use and that I don't need to futz with a clasp when putting it on and taking it off. cabochon, put it into the finding, making sure that the glue has spread to stick to the finding, and then flip it face down and leave it to cure overnight. Once cured, add a jumpring to the loop. String a half a bracelet length, more or less, with one colour of donuts. Add the cabochon dangle charm, on it's jumpring, and then string the other colour on the other half. Knot the stretchy cord to itself with a square knot and a surgeon's knot. Add one donut, remember this, and then string more donuts, half and half of the colours again, so one side will be one colour and one side will be the other colour. Mine came out a little uneven because I had another colour I was going to use and then decided it didn't work as well and took them back off. You should have strung one more donut than the first strand. Now make the loop and knot the stretchy cord in a circle, but not at the knot, but after that first donut that I told you to add. So you will end up with a donut spacer between the two strands of donuts. Grab another jumpring, and open it (remember - only twist to the side to open jumprings) - and add it to the second strand, at the same count of donuts as the first, and then link it to the other jumpring with the dangle. This keeps the strands together and shares the weigh of the dangle. Seal the knots with a drop of Hypo-tube cement, let it cure, trim the ends of the knots, and you are good to go! Dab a little bit of glue on the back of the cabochon and place into the bezel setting. Lay flat while waiting for the glue to cure fully before wearing. 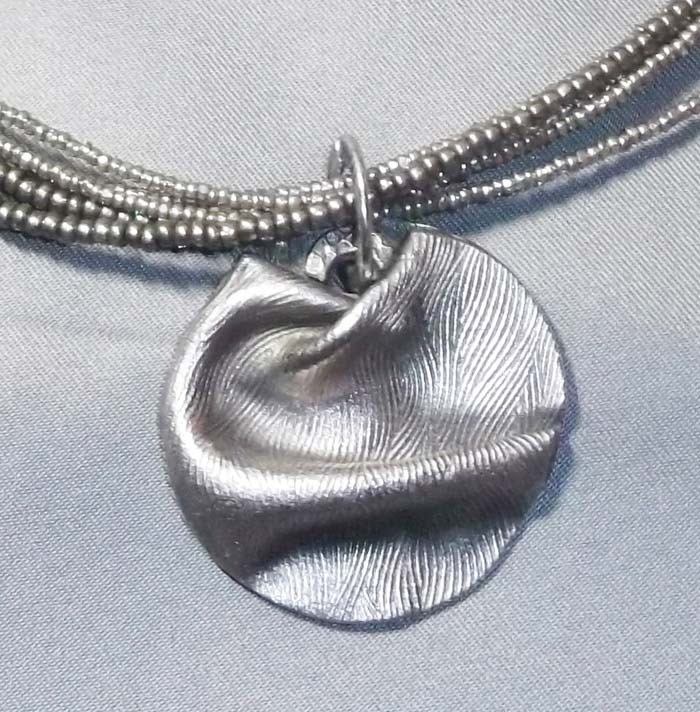 The fishhooks are already attached to the bezel for you! Now you are really good to go!!! If you saw our InspirationFX project from a couple of weeks ago - you know that firepolish donuts are undergoing a renaissance - and I am madly in love with them - and also with easy stringing stretchy cord! Easy breezy lemon squeezy armfuls of wrist candy - and today - we have more! 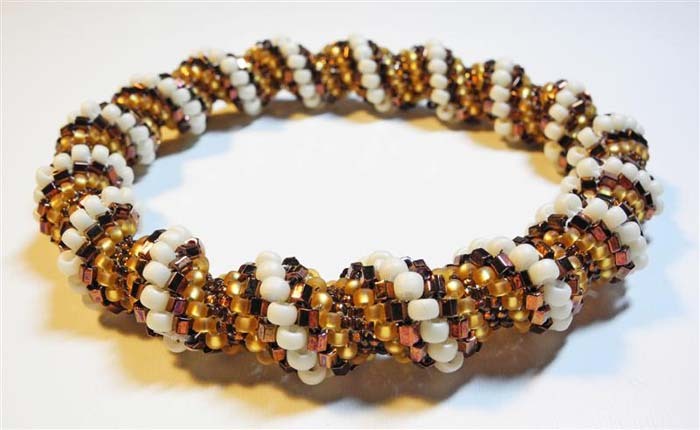 Because - when it comes to beads - more IS more! Not only do we have a truly scrumptious selection of the medium size donuts (5x3mm and 7x5mm) and large (9x6mm) - but we also have a bunch more of the tiny little 3x2mm donuts! Now I've been having gobs of fun making bracelets that don't need clasps - but that doesn't mean that clasps don't have their place! In fact - these super handsome clasps are too nice to hide at the back of your jewelry and deserve to be up front and part of the design! And for the shaped-bead fans - we can't let you go a week without your new-bead fix - and this week - it's the "Gold Shine" colours of the SuperDuos! Yum! And so there it is for this week - click on a link or image above, or just check out all the new items here and see what mooooves your herd! What's on my bead mat - July edition!